The nave is covered with a yaulted ceiling built by Lucas Schleierweber in 1535. It is 23.98 melers high. Only under the gallery, the vault is higher, reaching almost 26 meters. Jesuits built over the windows of the nave. 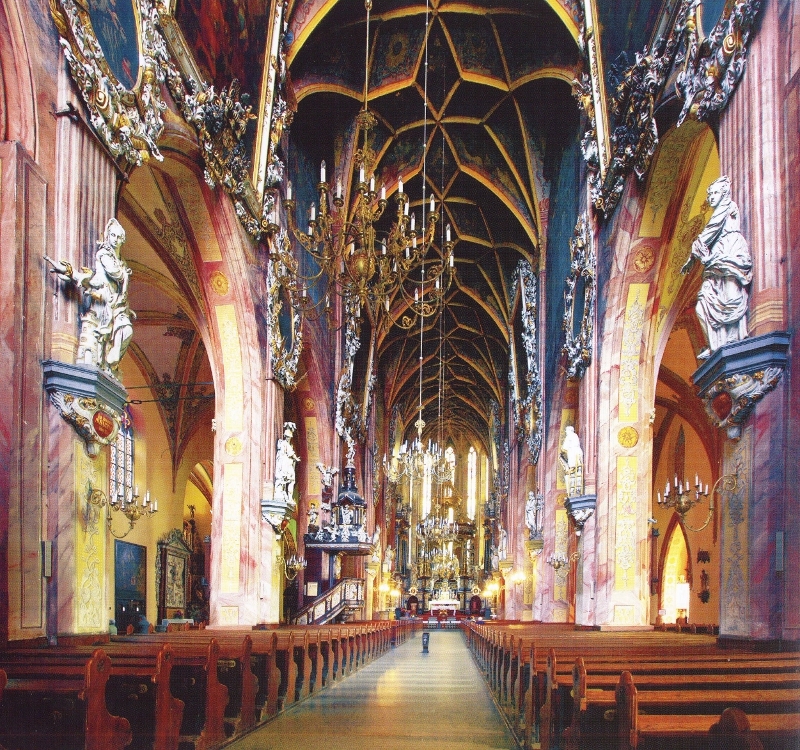 In 1739, Johann Georg Etgens from Brno (1693-1757) decorated the wali of the nave with illusionist polychrome. Pillars of the nave arę flanked by the figures of the patrons of the churches at city gates. They arę work of George Leonhard Weber, sculptor from Świdnica. They datę from the years 1709-1710. Fach of the figures had a patron, except Saint Wolfgang. On the north side – Saint Barbara, Saint Martin, Saint Wolfgang, Saint Pe-ter. On the south side – Saint Margaret, Saint Laurence, Saint John the Baptist, Saint Nicolas, Saint Paul. The walls ofthe nave arę decorated with huge paintings de-picting scenes from the lives ofthe Saintpatrons ofthe church. On the north side from the west: Saint Stanislaus giving away his wealth to the poor, founded by Anton Schaffgotsch, curvcd frame with the emblem of the founder – J.A.Y.S. – Johann Anton von Schaffgotsch, canyass, oil paint, J. Knechtel, 1711; Saint Stanislaus curses king Boleslaus the Brave (using power of the keys), founded by Jesuits from Świdnica, curved frame with Jesuit emblem (SCIS – Collegium Societatis lesu Svidnicensis), canyass, oil paint, J. Knechtel; Saint Stanislaus resurrecting Piotrowin, founded by Dominik Geyer, Cisternan Abbot from Krzeszów, curved frame with coat of arms of tnę Abbot and Krzeszów Abby (DACG – Dominicus Abbas Genobium Grissoviensis), canvass, oil paint, J. Knechtel. On the south side from the west: the poor pay homage to Saint Vaclav who paying them a visit, founded by hr. von Nimptsch, curved frame with the founder’s coat ofarms (CFGN-Graf von Nimptsch), J. Knechtel; Saint Vaclav orders building of a church and destruction ofpagan statues in Czech province, curved frame with coat ofarms ofthe founder (MEGV N) hr. 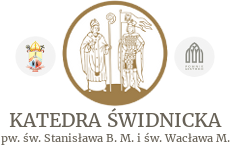 von Nostitz, Jeremias Knechtel; the emperor Henry I welcomes Saint Vaclav who enters, in company of angels, the debating cham-ber in the Parliament in Ratyzbonie – curved frame with coat ofarms of Świdnica (AMS-Amplissimus Magistratus Svidnicen-sis), J. Knechtel. Below thc largc paintings of the nave, you will find paintings in curved frames. North side, from the west – Saint Aloysius Gonzaga, can-vass, oil paint, J. Knechtel; Saint Paul Miki, canvass, oil paint, J. Knechtel; Saint Ignatius Loyola, canvass, oil paint, Eybelwieser; Jesus, canvass, oil paint. South side, from the west: St. Stanislaus Kostka, canvas, oil, J. Knechtel, Saints Jan de Goto and J. Kizai, canvas, oil, J. Knechtel, St. Francis Borgia, canvas, oil, Eybelwieser, St. Francis Xavier, canvas, oil, Eybelwieser, Mary, canvas, oil, Eybelwieser.